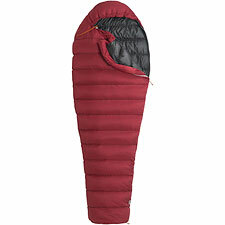 Ultralighters rejoice: the Marmot Atom is a sub-1 pound sleeping bag featuring the same high-quality 900 fill goose down and Pertex shell as the bestselling Marmot Helium. In terms of construction, the Atom is basically the same bag as the Helium, plus snazzier colors—but minus a pound of down. A pound of down, however, turns out to be a lot of feathers. If you're considering the Atom for your gear closet, give careful thought to your needs and preferences. Do you like a little extra warmth at night to keep you extra cozy? If so, you may find the Atom a tad on the chilly side, especially as the temperature nears the Atom's 40° F rating. For most people, a 40-degree limit pretty much rules out the Atom for sleep-under-the-stars comfort in the mountains, even in summer. On the other hand, if you're primary concern is carrying as little weight as possible—and your willing to try a few mitigating strategies—the Atom can serve as the perfect basis for a bivy system, even in quite cold conditions. If you stay out of the wind, sleep in your clothes, put a hot water bottle next to your chest, and don't mind shivering a bit, you can take the Atom well below its temperature rating. I felt bold enough to take the Atom up Avalanche Gulch on Mount Shasta, where I was rewarded with 60 mph wind gusts all night long. I can't claim I was comfortable, but the Atom kept my core temperature in the green zone, despite the awful weather, and for that I was much obliged. The Atom might also work for you if you pair it with an ultralight tent, such as Black Diamond's Firstlight. A tent will give you an extra margin of climate control, effectively boosting your bag's usable temperature range. Another choice, which has worked well for me, is to match the Atom with a good Bivy Sack. Doing so should buy you another 10 degrees or so, enough to sleep in relative comfort on those mild late-spring tours in the high country. Temperature concerns aside, you'll love the Atom's insignificant 1 pound weight and tiny stuff size. I can't recommend this bag for mid-winter use (for obvious reasons), but for spring mountaineering, even at higher altitudes, you may well be happier trading a pound of feathers for a fleece jacket, or nothing at all. Give it a try. note: to conform to stricter EN temperature rating guidelines, the updated Atom is now warmer—and thus a bit heavier than the original, 1-pound model.